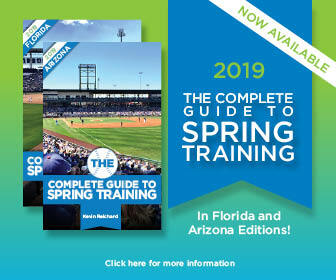 We’ve posted the 2012 spring-training schedule for the Minnesota Twins, complete with 17 games at Hammond Stadium in Fort Myers. The Twins will report early for training camp — at least by Minnesota Twins standards — with pitchers slated to report on Saturday, Feb. 18, with their first workout slated for Sunday, Feb. 19. The balance of the squad is scheduled to report on Thursday, Feb. 23, with full-squad workouts beginning on Friday, Feb. 24. The Twins will be sticking close to home and the Gulf Coast, with virtually every game taking place in the area or Lakeland save a March 17 match against the Miami Marlins in Jupiter and a March 25 game against St. Louis at Roger Dean Stadium. That means lots of games against local team, including five visits by Tampa Bay (with nine games in all against the Rays) and six games against the Boston Red Sox. The Twins’ 2012 Spring Training Schedule concludes with a home game on Wednesday, April 4 against the Florida State League’s Fort Myers Miracle. Spring Training season and group tickets are now on sale and can be purchased by calling 1-800-33-TWINS or 612-33-TWINS. Single-game tickets can be purchased beginning Saturday, Jan. 14 at www.twinsbaseball.com, by calling 1-800-33-TWINS, by visiting the Target Field Box Office or the Hammond Stadium box office in Fort Myers. Beginning Saturday, Jan. 14, box office hours at Hammond Stadium, are from 9 a.m. – 4 p.m. (EST) Monday through Friday, and 9 a.m. – 2 p.m. (EST) on Saturday and Sunday. The Hammond Stadium box office will have extended hours on Saturday, Jan. 14, as tickets can be purchased from 9 a.m. – 4 p.m. (EST) on that day as well as during home games.